Biting midges (Culicoides sp.) are small, sometimes barely-visible, blood-sucking flies more commonly known in many areas as biting gnats, sand flies, biting midges, punkies or “no-see-urns." Their biting activity is extremely annoying, and it can affect outdoor work ad activities and impact the economy of some coastal areas by discouraging tourism. Biting midges are sometimes only 0.5 mm long. The legs are unmarked or banded and the wings are clear or spotted. Only 0.25 mm long, the tiny eggs are initially white but soon turn dark brown. The wormlike larvae are white with dark heads and are 3.5 to 4 mm long when fully grown. A short, brush-like breathing structure protrudes from the last abdominal segment. The light- to dark-brown pupae are sometimes about 4 mm long. Figure 1. Biting midge. A-B. Adults. C. Egg. D. Larva. E. Pupa. Figure 2. Culicoides biting midge. 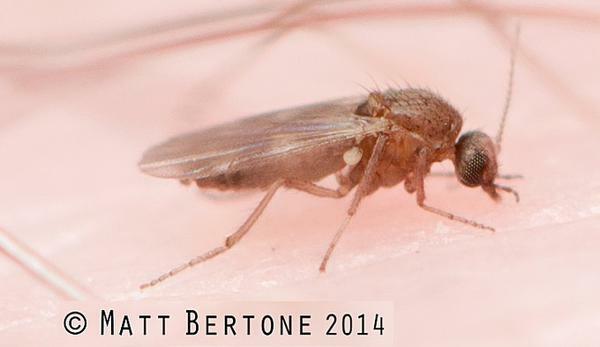 Biting midges breed in salt and fresh water habitats throughout the world. Biting midge larvae consume decaying organic matter in mud, intertidal sand or wet soil around water holes and seepage areas. Along the coast, decaying seaweed that is tossed up onto beaches after storms presents an ideal breeding habitat. Adults feed on liquid substances ranging from plant juices to body fluids of insects and the blood of vertebrates. Females of many species feed on mammals, including people. Biting midges generally overwinter as larvae and pupate in spring. The adults deposit eggs on mud or on sand and about one week later larvae emerge. The larvae are found in mud, salt marshes and intertidal sand. If removed from the substrate, each of the four larval instars is large enough to be seen by the unaided eye. After feeding and developing for 6 months to a year, larvae pupate and adults soon emerge. 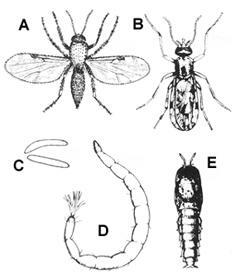 Adult biting midges live about a month. Females take several blood meals and lay several batches of eggs. The males feed on plant juices. Along the North Carolina coast and around inland breeding sites, flies are usually present throughout most of the warm weather seasons. Control of immature biting midges is impractical in North Carolina. Chemical controls (ULV, fogs, mists, and sprays) are only temporarily effective against adult biting midges, because more adults rapidly invade the treated area after the spray dissipates. Although screens on open windows are effective in keeping mosquitoes out, midges may find gaps or tears that allow them to enter homes. As with mosquito control, wide area control programs should be administered by professionals. In coastal areas, removing seaweed and other organic materials that wash up during storms and become trapped in intertidal areas helps to reduce breeding sites. For anyone engaged in outdoor activities, the best defense against biting midges is personal protection in the form of repellents (see Insect Repellent Products). Children and pregnant women should use repellents sparingly.